Chicken Little Theology | When I Survey . . . In his Skype conversation with Eric on Darkwood Brew, author Scott Russell Sanders said that one of the main reasons we so need to hunt for hope today is because it is so easy to become hopeless in this information age. I think he is quite right about this, and it got me ruminating on my many years in the church when I experienced what I came to call “Chicken Little” theology. You will recall the folktale, which is told in many versions around the world, about a chick named Chicken Little who gets hit on the head by an acorn and believes that “the sky is falling.” This is clearly not the smartest creature that ever lived, but is a chick of action. 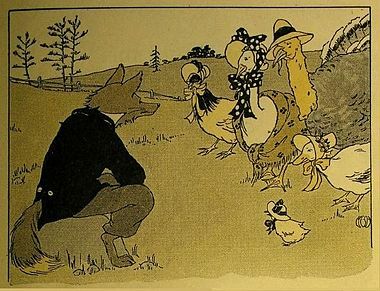 Chicken Little decides to go warn the king and on the way meets a variety of other animals with funny rhyming names like Henny Penny and Turkey Lurky, and convinces them all that “the sky is falling.” In the original versions the animals usually come to a bad end, as in being lured into a fox’s den and eaten, but this was deemed not suitable for small children so in the current versions they are rescued. Many years ago, in the days before the Great Recession, I was sitting in a church meeting, and I can’t remember for the life of me whether it was a budget meeting or a stewardship meeting, but it doesn’t matter to my story, because either can induce the kind of hopelessness that I began sensing in the room. Now these were good people, the kind that give generously of their time and their money to make the world a better place, so I want to be clear that the world is not divided into the hopeless and the hopeful. All of us are prone to bouts of hopelessness at times, but the point I want to make, and I think it is what Sanders was saying, is that hopelessness is often a social phenomenon. And this is where Chicken Little comes in. I was sitting at this meeting with all these faithful church people, and the more people talked the more fear there was in the room. You could sense it, you could almost smell it. Fear for the future, fear for the congregation’s prospects. And sometimes a pastor’s job is to remind people who we are and whose we are, so I spoke up and said, “The first words in the preamble to our church (The United Church of Christ) are: ‘Jesus Christ is the sole head of the church,’ but the way we’ve been talking you might think it was Chicken Little.” This became known as my “Chicken Little” speech, and after many years the old hands on the committees waited with amusement for it every fall when we did our budget and pledging. Chicken Little theology is bad theology. It misinterprets experience and makes faulty plans based on them. Chicken Little theology is turning a fallen acorn into the end of the world. It is true that some of the things we have to worry about are not trifles like a fallen acorn. That is one of the things I am enjoying as I read Sanders’ book; that he doesn’t flinch at the world’s problems in his hunt for hope. But such collapses are not the final word about the future. The prognosticators have a very low batting average when it comes to predicting the future. One needs a better theology than Chicken Little theology if one is to live one’s life, in all circumstances, full of hope. I now want to hear your Henny Penny speech. Great post.